A new study in the Proceedings of the National Academy of Sciences suggests that the ecological structure of dinosaur communities made them sitting ducks for extinction after the Chicxulub asteroid impact 65 million years ago. For the study, scientists from the University of Chicago, the California Academy of Sciences, and the Field Museum of Natural History, reconstructed terrestrial food webs for 17 Cretaceous ecological communities. Seven of these food webs existed within two million years of the Chicxulub impact and 10 came from the preceding 13 million years. Their findings are based on a computer model showing how disturbances spread through the food web. Peter Roopnarine, from the California Academy of Sciences, developed the simulation to predict how many animal species would become extinct from a plant die-off, a likely consequence of the impact. The results paint a picture of late Cretaceous North America in which pre-extinction changes to food webs – likely driven by a combination of environmental and biological factors – result in communities that were more fragile when faced with large disturbances. “Besides shedding light on this ancient extinction, our findings imply that seemingly innocuous changes to ecosystems caused by humans might reduce the ecosystems’ abilities to withstand unexpected disturbances,” Roopnarine noted. The computer model used describes all plausible diets for the animals under study. In one run, Tyrannosaurus might eat only Triceratops, while in another it eats only duck-billed dinosaurs, and in a third it might eat a more varied diet. This stems from the uncertainty regarding exactly what Cretaceous animals ate, but, according to the researchers, this uncertainty actually worked to the study’s benefit. “Using modern food webs as guides, what we have discovered is that this uncertainty is far less important to understanding ecosystem functioning than is our general knowledge of the diets and the number of different species that would have had a particular diet,” study co-author Kenneth Angielczyk explained. Angielczyk, from the Field Museum, said data derived from modern food webs helped the simulations account for such phenomena as how specialized animals tend to be, or how body size relates to population size and thus their probability of extinction. The researchers also selected for their study a large number of specific food webs from all the specific webs possible in their general framework and evaluated how this sample of webs respond to a perturbation, such as the death of plants. 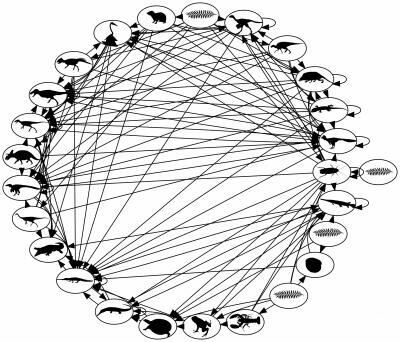 They used the same relationships and assumptions to create food webs across all of the different sites, which means the differences between sites just stem from differences in the data rather than from the simulation itself. “We aren’t trying to say that a given ecosystem was fragile, but instead that a given ecosystem was more or less fragile than another,” Roopnarine noted. 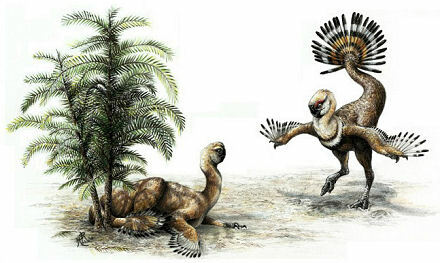 The researchers speculate that a combination of changing climate and other environmental factors caused some types of animals to become more or less diverse in the Cretaceous. In their paper they suggest that the drying up of a shallow sea that covered part of North America may have been one of the main factors leading to the observed changes in diversity. The researchers stress that the study provides no evidence that the later Cretaceous communities were on the verge of collapse before the asteroid hit. “Unusual circumstances, such as the after-effects of the asteroid impact, were needed for the vulnerability of the communities to become important,” Mitchell noted. The findings have important implications for modern conservation efforts, say the researchers. “The robustness or fragility of an ecosystem under duress depends very much on both the number of species present, as well as the types of species,” Angielczyk said, referring to their ecological function.